Using a small brush to clean the gaps between teeth, is much more convenient for many than good old floss. Sadly, it is not quite as simple for me to say that this…is the best interdental brush for you. The reason that there is no simple answer is because different people need different sized brushes. So what might be right for Richard, might not be right for Barry. A slightly longer and more detailed explanation as to why is available, just jump to the section that explains the TePe product range. 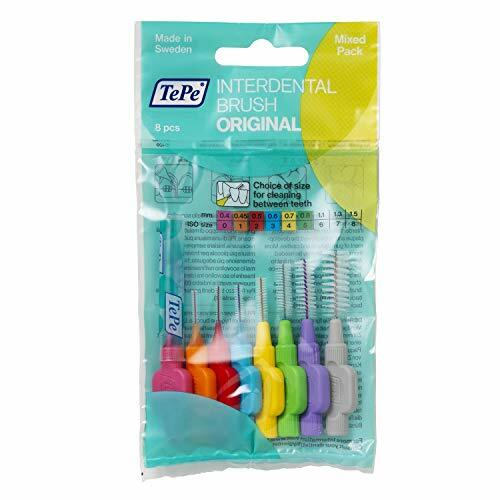 But, with that said, a fantastic option and a good all round choice is this pack from TePe, which contains a variety of different sized brushes. Within this article, I go into great detail about interdental brushes, with a comprehensive guide to interdental brushes included, so you should know all you need and want to buy the end. Having been making oral hygiene products since 1965, Swedish company TePe are a well established company within this industry. Much like Ikea, another well know Swedish company, they have an attention to detail that is to be commended. Products are made to a high standard and functional and they give what the customers need and want. Remaining true to their roots, their headquarters are based in Malmo, Sweden where the company began. The products are produced here too, using renewable energy. As you might expect though, they do have a US office in California. Company founder Henning Eklund, designed in 1965 the tooth stick, which has evolved over the years into the diverse range of toothbrushes and tongue cleaners they make today, but despite having a range of products they are best known for their interdental products or as many simply know or refer to them as ‘TePe’s’. If TePe do not have the interdental brush suitable for you, then it probably does not exist. Whilst other alternatives like DenTek interdental/easy brush options exist (view on Amazon) you simply do not have the same range of options as TePe. Catering to the average person and to those with more specialized needs, they even have options for those who have implants and braces. Most significant in my opinion is the sheer number of different sized brushes that exist. Not just small, medium or large, we are talking differences of 0.1 millimetres between brushes. There are 9 different sizes in total. With convenience in mind, each interdental brush handle is a different color to make it really simple to know and learn which size you need for your interdental spaces. Whilst core to the brush is a wire that the bristles connect to and flexes when in the mouth, for safety and a more gentle clean, this wire has a plastic coating. The brushes normally come supplied with a clear cap that fits over the brush head to protect it if required. This is particularly useful when travelling. However, the plastic lid can also be used as an extension to the handle thanks to the way in which the products have been designed. Few people really realize that the gaps in between teeth are different sizes. Some of us have really small and tight gaps, where others have much larger gaps. Where regular string or dental tape floss does vary in size, it tends on the whole to be better suited to those with very tight gaps between teeth. Interdental brushes on the other hand can work better for those larger gaps. But seeing as everyone’s mouths and teeth are different there is no 1 size fits all. Particular sizes and types of interdental brushes are better suited to some individuals more than others. Each brush is measured in millimetres (mm) and the width ranges from 0.4 right through to 1.5mm in size. The size of the brush is the diameter – in other words, how wide the brush is. It is no good trying to force a brush that is 1.5mm in width in space through a gap that is no bigger than o.5mm, you will simply do damage to yourself and the brush. Some individuals many need only 1 size of brush because all their gaps are of the same width. Some may need 2 different sized whilst others may need 3 or 4. And for some others, it might be that dental floss is the best answer. The need for different sizes is because of natural spaces (or lack of) between your teeth. Other things that may affect the size of the gap between your teeth include if you have had any teeth removed, or if you have previously had gum disease. Normally, the space between the back teeth is larger than between the front teeth. To help you find the right size for you, you can purchase an assorted pack (view on Amazon) or take a visit to your dentist or dental hygienist and they can tell you exactly what size to use by measuring your interdental spaces, whilst demonstrating to you the best techniques for flossing. So how do you know you have found the right size? The brush should slide between the teeth under gentle pressure, whilst still touching the teeth on both sides. There should be a little bit of resistance as you use the brush. On the other hand, the brush should not be so big that you have to force it through the gap and end up bending the wire. Importantly, do not be too concerned if your gums bleed the first few days of using them. They are bleeding because you have gum disease and the gums are irritated. With regular use, the bleeding should stop after just 7-10 days. If you have a hygiene appointment with your dentist or hygienist they can also advise which sizes are best for you as an individual. However, TePe has produced a really useful chart, that you can use to help find and more importantly remember which sized brushes are right for you. It will take a few minutes to get yourself set up, test and find what’s right for you, but the effort should be worth it. The iconic interdental brush. Available in 9 different sizes, it has a straight brush head and short handle. You can buy these from Amazon or direct from TePe as a 6 pack or 25 pack. The same sort of design as the original but with extra soft filaments and a range of 6 different sizes. These can be ideal if you are suffering with gum disease or need to clean spaces after dental surgery. Available as a pack of 8 or 25 you can buy these online at TePe’s website. This is where TePe show off their true colors by offering a product that very few others even think of. It is the same style of interdental brush as the end of the handle, but the handle itself is much longer and at a slight angle. What this ultimately means is the same great cleaning experience but considerably more ease in positioning and moving the brush in and out of those interdental spaces, particularly those right at the back of the mouth. It removes the fiddly approach of floss and you may also find these easier to use if you struggle to grip the regualr brushes, because of the longer handle. Available in 6 different sizes the handles are again color coded to the size of the brush. You can get a pack that contains all six sizes here on Amazon, including a mixed pack. To keep your different interdental brushes neatly organised in the bathroom you can pick up a TePe interdenal brush stand and for those who travel a lot, there is a travel case that will hold up to 6 of the original or extra soft brushes. You probably know exactly what it feels like to have something stuck in between your teeth. I am not sure if it is just me or this appears to happen when I am away from home, eating out and I have no toothbrush or toothpick on me. For what then seems like an eternity I do all I can to dislodge the stuck food debris, but its always tricky to budge when you don’t have the right tools to hand. A 2017 survey for Waterpik, in consultation with the American Dental Association found that anything from fingernails to strands of hair were being used to help get stuck food out from the teeth. A potentially more practical and convenient option for everyone is to carry TePe’s EasyPick, a more modern take on the toothpick. There are the Blue colored picks that are M/L in size and the Orange picks that are XS/S and suitable for the most narrow of gaps. Coming in packs of 36, made up of 6 strips, each containing 6 picks, they are designed for 1 time use. A handy storage case is provided, so you can carry these with you, wherever you may go. Just open the case, pull off a pick, use and then dispose of the EasyPick. A silicone coating to the long and flexible head cleans effectively whilst feeling comfortable on the gums.There is a non-slip grip handle to ensure you don’t lose control when in use. When it comes to using, you use in the same way you would a regular interdental brush. Buy TePe Easy Pick XS/S on Amazon. Buy TePe Easy Pick M/L on Amazon. Very similar to TePe is the range of brushes from Australian firm Picksters. They offer up to 10 different sized brushes. 8 are the more standard sized brushes with 2 new and much larger options for those who require them, most notably those with periodontal conditions. The color and sizing is different to TePe but what I particularly like is the larger pack sizes they come in. 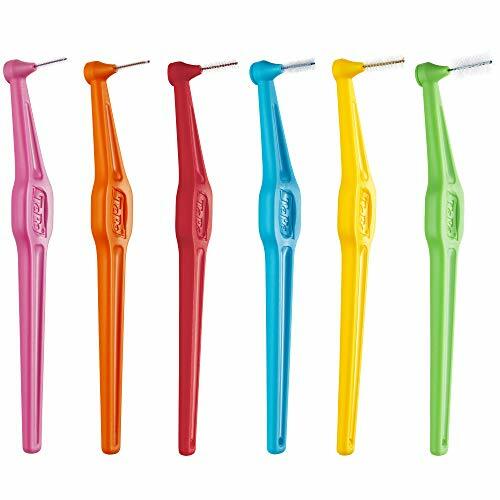 They represent good value and considering you replace interdental brushes like these fairly regularly it can make sense to buy more at once. You can view the range available on Amazon. Where to buy interdental brushes? You can buy interdental brushes, be that from TePe, DenTek, Picksters, Curaprox or Plackers. Amazon have a great range of choices and deliver to your door, but Walmart, CVS Pharmacy, Target, Walgreens and many more. Cleaning between the teeth, however you do it, aims to remove the bacteria and food debris that builds up during the day, and which ultimately leads to tooth decay and gum disease. Data (1 & 2), shows that too few of the population are flossing enough and dental professionals are typically finding that patients find the use of interdental brushes to be more convenient for patients and more are sticking with flossing as a result. An interdental brush or as it may also be referred to an ‘interproximal brush’, is a small brush specially designed for cleaning between your teeth, where a regular toothbrush is not able to reach. Interdenal brushes have small bristled heads that reach deep between the teeth to release and sweep away food debris and bacteria. Available in a variety of sizes and styles, you need to find the right ones for you. Why should I use an interdental brush? Bacteria and food debris left between the teeth causes two problems: tooth decay and gum disease. Toothbrushing cannot reach between the teeth and so interdental cleaning is needed. Periodontal disease is commonly triggered by the high volume of plaque that has built up on the teeth and under the gumline. When you eat, the bacteria feeds on the debris left behind. It is entirely natural and there is little you can do to stop it forming, but you can slow it down and clean it away. Regular brushing, even with an electric toothbrush, leaves up to 40% of tooth surfaces untouched. This is where flossing or the use of interproximal brushes like those from TePe come in. When used correctly, they make contact with the remaining tooth surface, removing the plaque and reducing the changes of you getting gum disease and ultimately leaving your mouth cleaner and fresher. Are interdental brushes any good? Yes, our experience at Electric Teeth has been very good, Interdental brushes also come very widely recommended by dental professionals. Whilst interdental brushes tend to be more expensive than floss they are more complicated, and you require more than one style or size in most cases. However, reviews by Cochrane Library advised that cleaning between the teeth with interdental brushes (on top of your usual brushing) not only reduces more plaque than tooth brushing alone, but that interdental brushes remove more plaque compared to flossing. This means that, the price can be soon outweighed with the convenience and noticeable quality and easy of use. For those that wear braces in particular, these are fantastic. How do I use an interdental brush? The first thing you need to do is find the right sized brush for your teeth. This can be done though a bit of trial and error, gently trying the different sized brushes in different spaces to find the one right for you. Don’t go forcing brushes to fit. You might want to get your dentist or hygienist to help, by measuring the spaces and giving their professional suggestion on which to use. It will be quite rare for just 1 size of brush to be appropriate, you will likely need a couple of different sizes. Purchasing a multipack with different sized brushes in helps. Once you know which you need, you just need to remember which colored brush to use in which space. Ensuring you have the right size for the space, you should feel some friction when inserting the brush between the teeth and the gums should slightly blanche white. The area that is most important to clean is the triangle part of the gum- in-between the teeth. Push the brush all the way through, now slightly angling it upwards so not to catch the gum on the inside of your mouth. Repeat and again when withdrawing the brush pull against the side of the other tooth. It’s important to manually disturb the plaque, so you don’t have to apply toothpaste to the brushes. If your gums are particularly sore, run the brush under warm water to soften the bristles. For the back teeth, gently bend the neck of the brush into a right angle for better access and pop the cap onto the end of the brush to make it longer. If you are struggling to reach around your back teeth because your cheek is in the way, insert the brush from the inside, ie, by your tongue or palate. This will give you more room. Use your brushes in front of the mirror until you get the hang of it. The following video from dentist Andre Hedger is really easy to follow and gives great visuals for you to understand and follow. Using a brush to floss the front teeth is easier than the rear teeth, primarily because of visibility and accessibility. Slightly different techniques are needed for the different areas of the mouth. The following steps explain how to best use the brushes. Use a straight interdental brush. Gently insert the appropriately sized brush into the space between the teeth, at gum level. Twist the brush slightly in a clockwise direction to help the brush access and fit into the gap. This can too prolong the life of the brush. When inserted, gently move the brush in a backwards and forwards motion, the full length of the brush. Repeat this several times to remove plaque and debris. You can use the same technique for teeth at the back of the mouth, however their position and the ability to reach inside and to the back of the mouth with regular interdental brushes can be quite difficult. Using products like the TePe Angle is ideal. The length of the handle and the angled head makes it much easier to reach these areas. You can insert the brush into the gap between the teeth in the same way you would with teeth at the front of the mouth, but with TePe Angle it is perfectly fine to clean this gap by inserting the tool from both the cheek and tongue side of the mouth. If you choose to use a regular TePe interdental brush, the thinner brushes (TePe Pink, Orange, Red or Blue) come with a bendy neck, so you can bend the brush by adding pressure with your finger. With larger sized brushes access and movement between back teeth may be improved if you bend the wire. You should repeat the interproximal cleaning for all spaces between teeth and only use floss to assist in cleaning the tighter gaps and the sides of the teeth that interdental brushes don’t reach or make contact with. Some top tips to consider and be aware of when using interdental brushes. The brush should glide through with relative ease, but with the feeling and sensation of a snug fit. If it feels too tight or you are having to apply pressure/force, then it is likely too big. Like a toothbrush you should thoroughly rinse off interdental brushes after use. You may notice over time that the brush feels less snug in the space. This is likely a sign that you have reduced any swelling that might have been caused as a reaction to not having previously effectively cleaned between the teeth. How often should I use one? Ideally, you should aim to clean with interdenal brushess everyday. Doing this, before toothbrushing last thing at night, before bed is best. Flossing before brushing allows the fluoride in the toothpaste to remain in the gaps after brushing, rather than being cleaned away by the TePe brush having just brushed your teeth with toothpaste. For some it is possible to replace regular flossing by making use of interdental brushes, but most still need to use floss. Therefore some dental professionals will suggest using both, but using one or the other is better than none at all. Most find interdental brushes easier to use, but if you can use floss too, you will be the one to benefit. Do I need to use toothpaste with interdental brushes? Some dentists do advise using it though to coat the areas with fluoride but also ease the movement or gliding of the brush into what can be quite tight spaces. How often do interdental brushes need replacing? The general recommendation is that an interdental brush can be reused for about a week or when the bristles become worn, wires buckled or distorted. You do not need to replace after every use unless they are damaged or worn. Why are my gums are bleeding? Bleeding gums can be a sign of gingivitis (gum disease). Diseased gums can bleed very easily and regular cleaning will result in healthier gums. If there is only a small amount of bleeding continue to brush for a few days and the bleeding should reduce. Should the bleeding continue beyond two weeks, or if the bleeding does not stop shortly after brushing, seek advice from a dental professional. Are you a fan of interdental brushes? Do you have any particular advice to offer when it comes to choosing them? Let us know in the comments below. Waterpik vs Flossing – Which is Best? Oral-B Hummingbird – can you still get it anywhere?